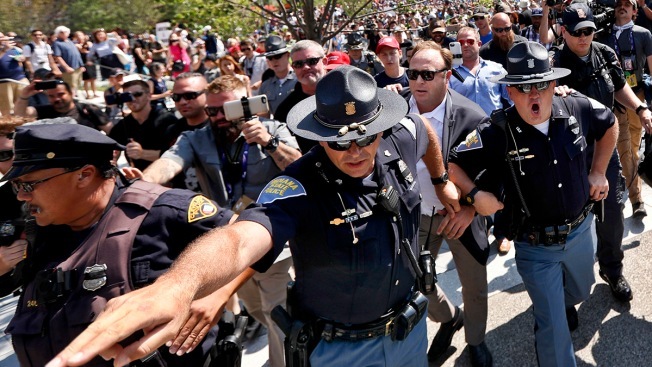 In this Tuesday, July 19, 2016, file photo, Alex Jones, second from right, an American conspiracy theorist and radio show host, is escorted by police out of a crowd of protesters after he said he was attacked in Public Square in Cleveland, during the second day of the Republican convention. Facebook has removed four pages that belong to conspiracy theorist and far-right radio host Alex Jones, explaining in a blog post Monday that content posted on the pages over the last several days violates the social media network’s community standards for "glorifying violence" and "using dehumanizing language to describe people who are transgender, Muslims and immigrants." Facebook unpublished the Infowars page, the Infowars Nightly News page, the Alex Jones page and the Alex Jones Channel Page, according to NBC News. Jones can appeal the site’s decision, but if he doesn’t appeal or if the appeal fails, the pages will be removed permanently. Jones had been warned that repeated violations of Facebook’s community standards would result in having his pages unpublished. Infowars didn’t immediately respond to a request for comment. The move comes after Apple and Spotify both removed Jones' podcasts from their platforms. YouTube also terminated Jones' main account Monday.